Thursday the 21st of November sees the launch of a new group exhibition I’ve put together in partnership with The Five and Dime Picture Show. They’re screening Scott Pilgrim Vs. The World on the 29th and so we thought a retro videogame themed art exhibition would fit in rather well. 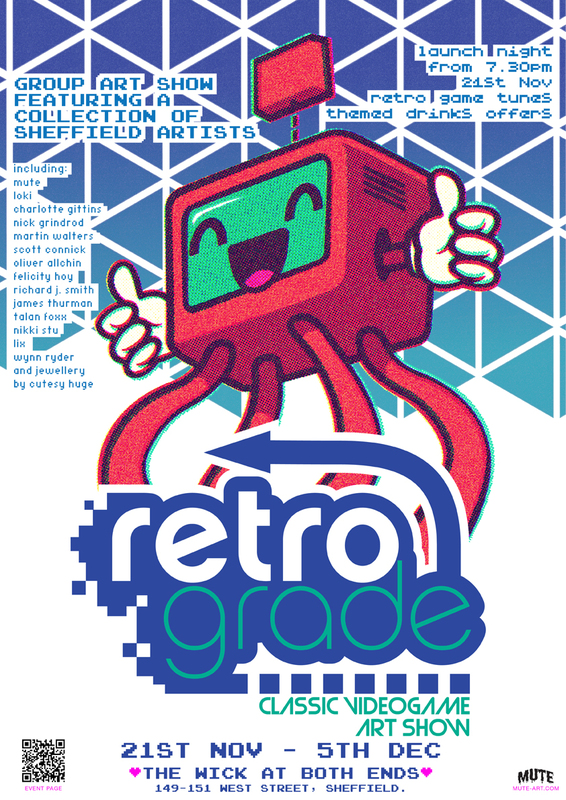 For two weeks The Wick at Both Ends on West Street, Sheffield will be adorned with artwork featuring everyones favorite videogames from the past. Including work by myself along with Loki / Charlotte Gittins / Nick Grindrod / Martin Walters / Scott Connick / Oliver Allchin / Felicity Hoy / Richard J. Smith / James Thurman / Talan Foxx / Nikki Stu / Lix / Wynn Ryder / as well as retro gaming themed jewellery by Cutesy HUGE. Thursday the 21st will also serve as the launch night for the exhibition so from 7.30pm you can enjoy a night of retro game inspired music and themed drinks offers as well as checking out the art! !